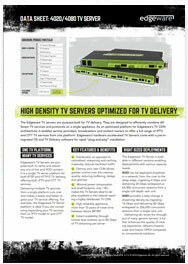 Edgeware’s high density TV servers are purpose-built for TV delivery. The servers are designed to efficiently combine different TV services and protocols on a single appliance. This creates a highly optimized platform for Edgeware’s TV CDN architecture, which enables service providers, broadcasters and content owners to offer a full range of IPTV and OTT TV services from one platform. Edgeware’s hardware accelerated Servers come with a pre-integrated OS and TV Delivery software for rapid “plug-and-play” installation.